Remember when we were in Langkawi about a month ago? I called this Malaysian island paradise. At that moment it WAS paradise. The sun was out, the beach was beautiful, and the ocean was warm. 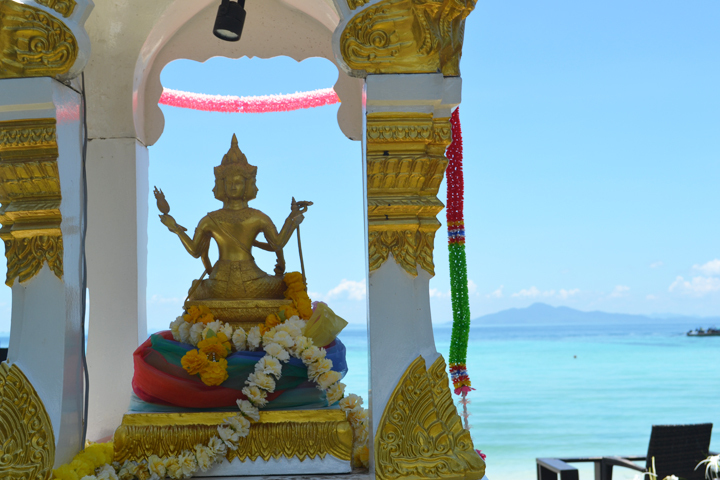 After several months in Penang we thought we had finally found our perfect island getaway. Well we were wrong. We found paradise. For real this time. 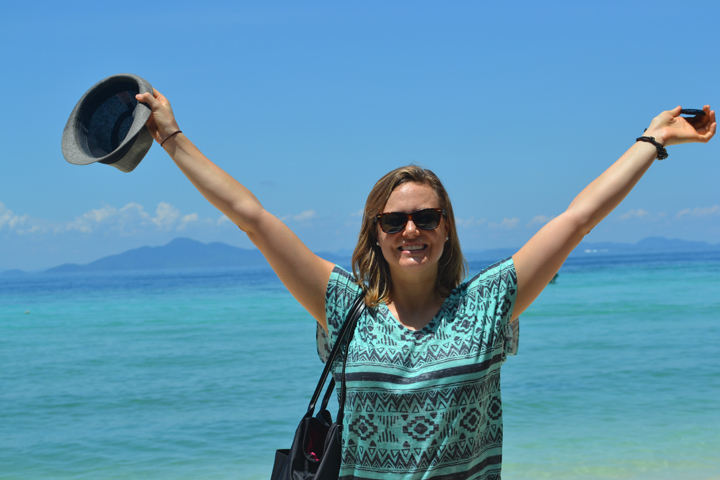 Welcome to the Phi Phi Islands. I am not kidding when I say this place is paradise. 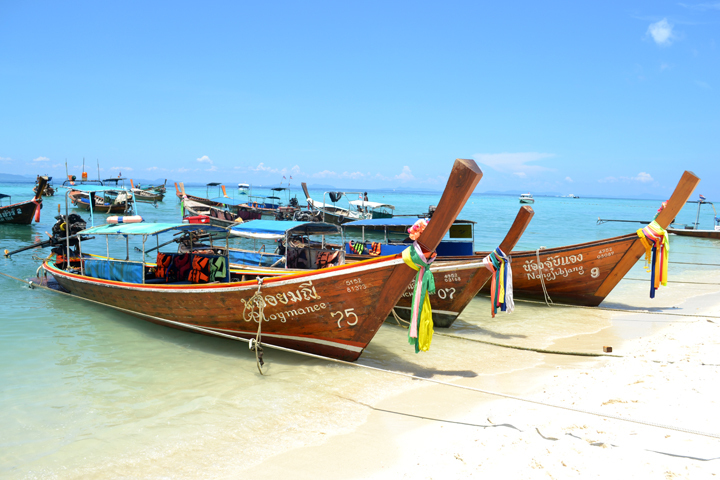 Compared to Phuket where we stayed one night, the Phi Phi Islands are a breath of clean fresh air, bright blue skies, and impossibly clear blue water. 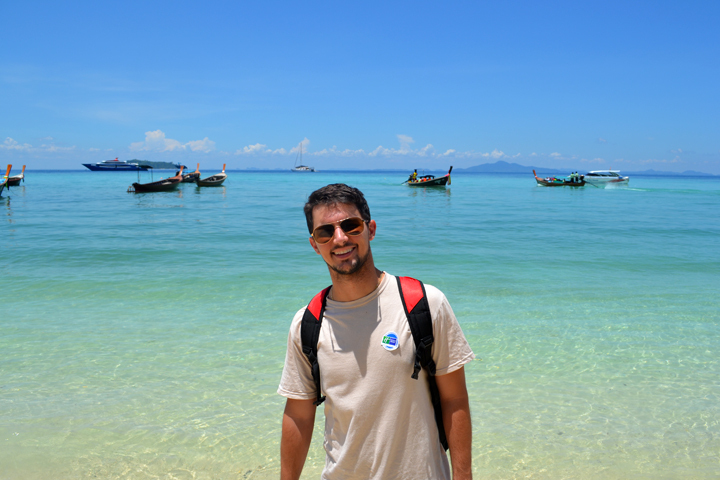 As we rode the ferry to Ko Phi Phi Don, the largest of the Phi Phi Islands, I could not believe my eyes. This is how I had always imagined South East Asia to be. 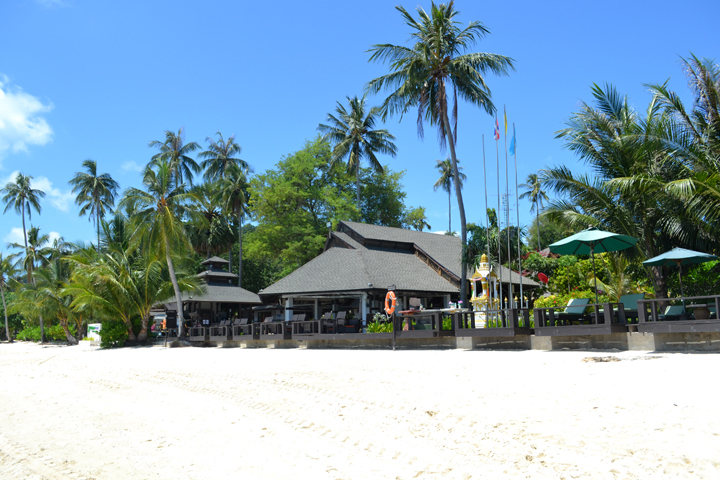 Soon we had arrived at our island getaway for the next 4 days… the Holiday Inn on Ko Phi Phi Don. 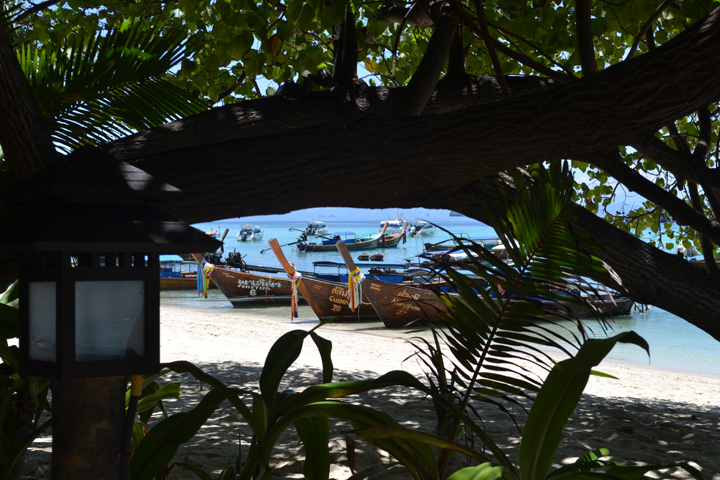 We waited anxiously for our long boat to whisk us away to our beach-side bungalow. After patiently waiting for pushy Chinese families to load up the first long boats, we finally settled into our own small and topsy turvy boat and puttered towards the shore. With a not-so-graceful stumble off the boat, we landed on the warm white sand. Fine warm sand between your toes is truly the best feeling in the world. The Holiday Inn is amazing to say the least. Small and cozy, the buildings are open to the warm air and made with dark wood that glistens in the sunshine. The pool is small but that hardly matters because the beach is just a stone throw away from each bungalow. The beach is not only close but also very long and exclusive to guests. Upon arrival, the staff led us to the main dining area and provided us with moist scented towels to wipe away the salt and sweat along with glasses of delicious fresh juice to sip. We relaxed while they checked us in. Too early to settle into our bungalow, we went in search of food. 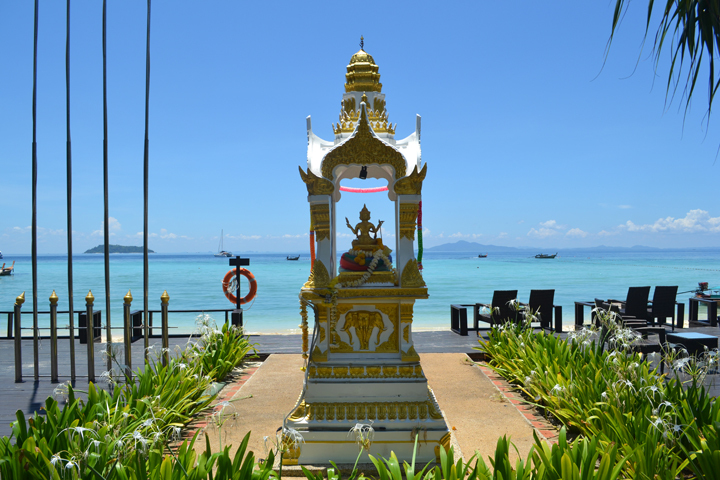 Before we could reach the beach-side bar, we encountered a glorious Thai shrine before the sea. Its many faced goddess sat with a serene expression and peaceful contenance. I’d look that way too if this was my view every day. 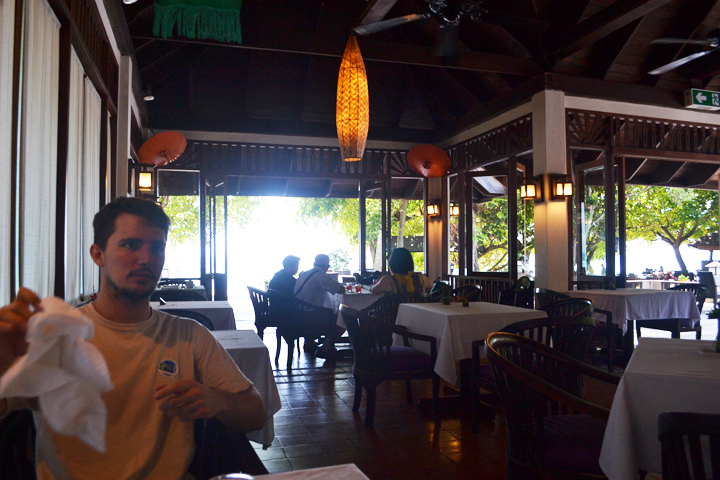 We settled in the restaurant and dined on pesto chicken and pad thai while enjoying the natural shade from the trees. Beneath the long branches peeked colorfully decorated long boats anchored on the beach, waiting to carry passengers to the islands beyond. After lunch we set off down the beach in search of a scuba diving center that could cater to newbies. We found an amazing place run by some Europeans and immediately signed up for a dive trip the next morning. Later in the day we would have to come back and take an introductory training course in the pool. I was absolutely terrified but excited at the same time. This is my excited and scared face. 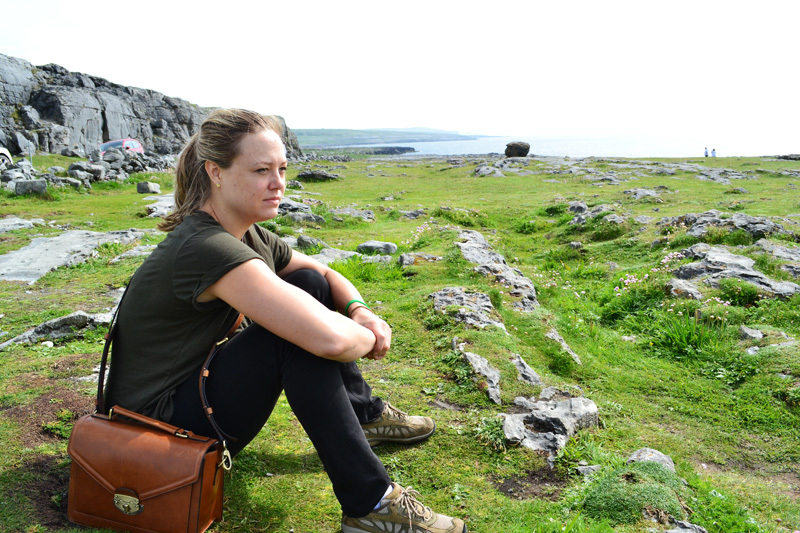 Already we were in love with the island and felt right at home among the sand and surf. I was relieved to be here after an exhausting travel experience and even more exhausting travel planning. We could finally relax and smile! 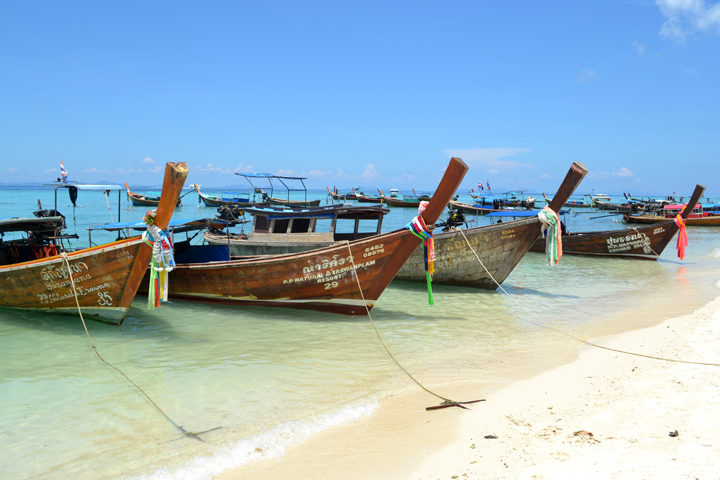 Thailand certainly lives up to its legendary status as tropical paradise. And the long boats! They are both beautiful and critical to the livelihood of the local Thai people. Each person takes great pride in their boat and decorates its heavy mast with colorful fabrics and flowers to distinguish theirs from the others. Although the car engines that run the impossibly long motors spew a nasty smoke and create a defeaning noise, these long boats make Thailand unique just as the fabric on the masts make each boat unique. They are my favorite part of the island. 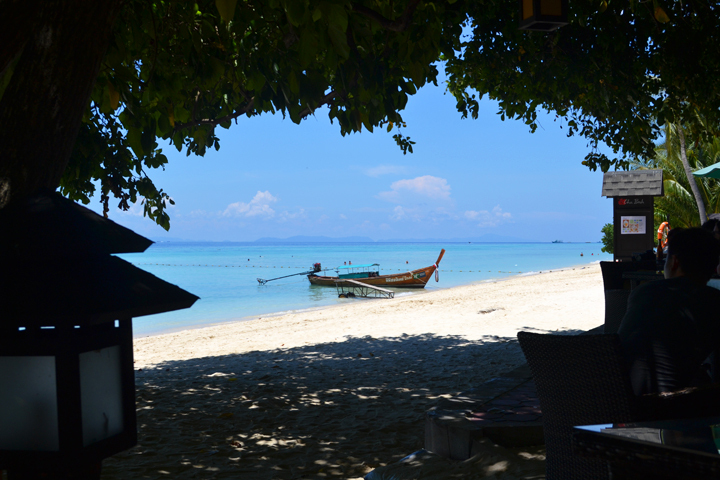 By end of the day I had only caught a glimpse of the Phi Phi Islands but was already under their spell. Little did I know that the next few days would change my life and inspire a new passion. What else would you expect if you found paradise? You tease… ending your post in a cliff hanger! Grrrrrrr. More please!